343/365 – “Meet Shadow” nr.9, a photo by Luca Rossini on Flickr. Ninth day of “Meet Shadow”. Long Sunday, today. Agata woke up with a few lines of fever and a terrible mood. I had to work till six in the evening for a complex shot I’m working on with Maura Manfredi for the Aracne contest (Maura is the artist with whom I created the X/Y Project, hosted on this blog between May and June). When work was over there still was to walk out Ombra, feed Agata and help Claudia with some housekeeping. So, not a relaxing Sunday, but not a boring Sunday either. Ombra and I had our walk between dusk and night. At that time, every Sunday, a big bunch of my neighbourhood is closed for cleaning due to the Sunday morning market of Porta Portese. Streets otherwise constantly busy with cars, motorcycles and pedestrians get suddenly and unnaturally desert, quiet, and covered by the trash that the market inevitably leaves behind. 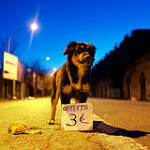 During the walk Ombra dug out this little paper sign promoting the goods offered for three euros. 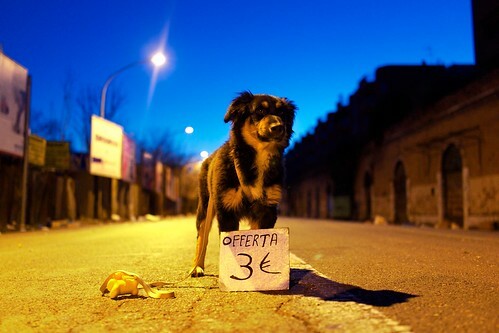 She looked so brilliant with that sign that I gently saved it from her chewing, put it at her legs, stepped back just a little, knelt and took this shot. It made me laugh, a lot.